1098s - What would cause a soft brake lever after strong braking? So lately at the track, after 2-3 laps i need to adjust the brake lever quite a bit more outside because it would require more pull distance to brake. As i put new fluids in before each trackday and apply air removal methods at calipers&cylinder, I thought it was the pads, had carbone loraine xbk on, and as i missed that stock 1098s pads first bite and feeling, i decided to buy a new set. Thing is, i bought the SC paste from brembo now, and after 200km that i think they are worn-in, after some hard road braking i had the same effect again. Had to adjust the lever further away - on the road not even pushing it hard. What is the deal here? Could it be the disks, 42000km on them and many trackdays, or i do not perform the air bleeding well? The fluid is motorex 5.1 always. Any chance there is damage on the cylinder or calipers? i have never performed any maintenance on them. ps - when the bike cools down, the lever is hard where i left it and i have to set it where it was before i adjust, until i brake some times again and i need to put it back further away again. 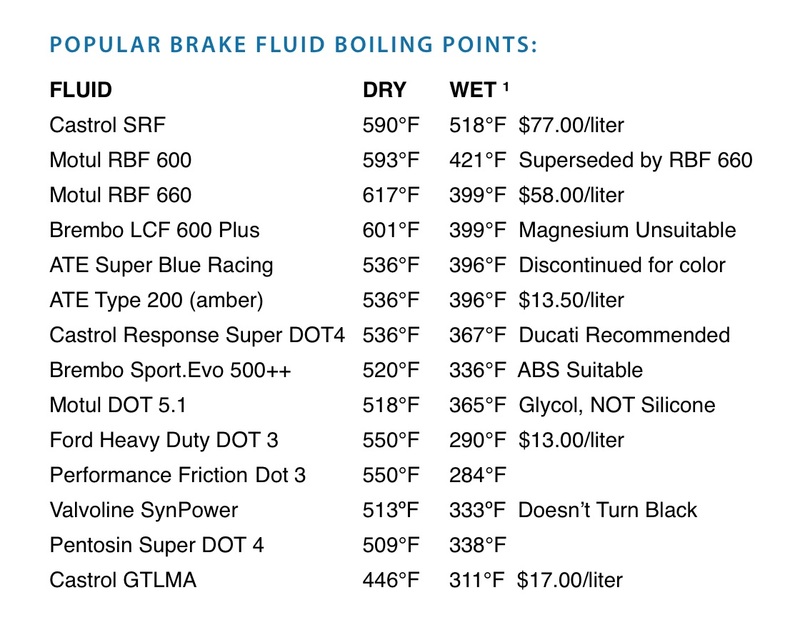 It sure sounds like your boiling your brake fluid. Try changing to a fluid that has a higher boiling point than 536°F. Castrol SRF is used by all the Formula 1 cars. Last edited by Shazaam! ; February 2nd, 2019 at 12:06 PM. Except for Castrol SRF, high performance brake fluids absorb moisture from the air quite quickly so it's important that you not use fluid from a previously opened container. If you do, the Wet Boiling temperature becomes controlling. The function of your brakes is to convert kinetic energy into heat – so the frequent repeated application of brakes on a racetrack is the most severe test of a braking system to disperse heat. 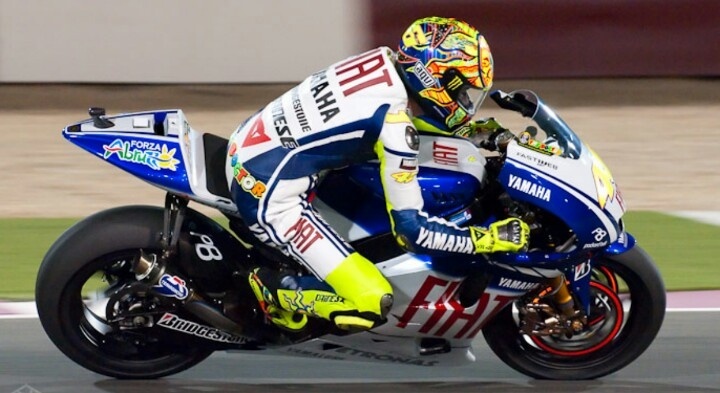 I'm sure you've seen pictures of brake discs glowing red on racebikes; everything gets really hot. Last edited by Shazaam! ; February 3rd, 2019 at 05:38 AM. Motorex 5.1 is a low viscosity fluid for newer brake systems (abs). I would switch to Motul RBF 600 or even Castrol GT LMA until you figure out the whole problem. If you have aftermarket levers, make sure that the amount of dead lever is right since that is a common problem. Adjusting the lever will mask, but not correct, the pushrod being misadjusted. Clean the calipers. Road grime on the pistons will cause the calipers to not work correctly. With the pads out, gently pull the brake lever a few times to expose the pistons so you can clean them. BE CAREFUL not to pump the pistons right out or you will have a brake fluid mess!!! You can leave two old pads as a spacer in the caliper to keep that from happening. I usually clean one caliper at a time so I don't have to watch all 8 pistons at the same time. Usually an old tooth brush and some methyl hydrate is all it takes to clean the pistons. thanks for everything. a fellow racer also suggested a fluid switch to motul as a first step, so i m gonna try that. I saw a video on motogp about remote braking. This sounds like your problem. As heat goes into the caliper under braking, the hydraulic lines and fluids also experience volume changes due to heat expansion/contraction. 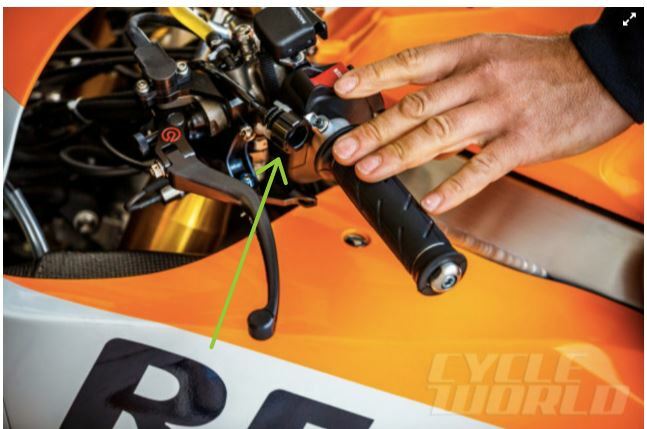 Meaning, riders' brake levers will not actuate in the same spot."